The Marijuana Control Board approved the first-ever commercial marijuana businesses in Alaska on Thursday. 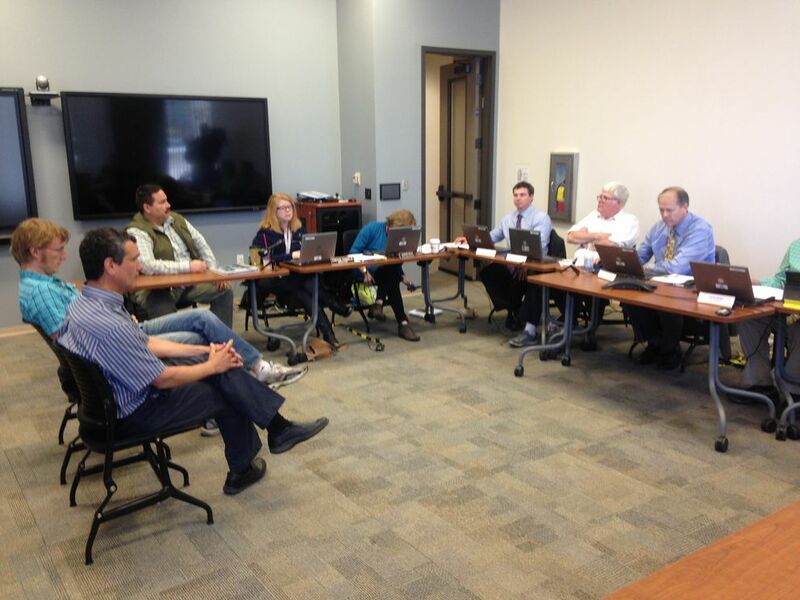 After a rocky start to the meeting, the board began approving cultivation and testing facilities in midafternoon. "Everything takes longer than expected," newly appointed Chair Peter Mlynarik said of the meeting's morning delays. But once approvals began, they were "going fast," he said. The first business to be approved was CannTest testing facility, located in Anchorage's Ship Creek area. CannTest was unanimously approved by the five-member board. The board's approval is contingent on local approval, which includes a 60-day protest period that must either run its course or be waived by a local government before a business can open its doors. CEO Mark Malagodi and lab scientist Jonathan Rupp sat side-by-side, answering questions from the board about how their marijuana testing facility will operate before the board's vote. CEO Mark Malagodi and lab scientist Jonathan Rupp of CannTest marijuana testing facility sit before the Marijuana Control Board on June 9, 2016. "Congratulations," board member Brandon Emmett said once the vote was completed, to audience applause. "That's history right there folks." The second testing facility up before the board Thurdsay was AK Green Labs, which was also approved unanimously. One by one, businesses answered questions from board members about specifics of their operations. The approved businesses were: Rosie Creek Farm in Fairbanks; Greatland Ganja, LLC in Kasilof; Sunrise Gardens in Fairbanks; Rainforest Farms LLC in Juneau; Three Sisters Co-Op in Kodiak; and Arctic Herbery in Anchorage. "I'm ecstatic," said Bryant Thorp of Arctic Herbery, as he rushed out the door at the end of the day. "I'm thrilled in many ways." Mike Emers, who flew from Fairbanks to Anchorage round-trip in order to attend two approval meetings in one day, also said he was "ecstatic" about the approval. "We are grateful to everyone in the state who have worked so hard to make this possible. We will not disappoint. We will make the state proud," Emers wrote in a text on his way back to the Interior community. Two business applications were tabled until a future board meeting. Talkeetna Herb Co. was put off due to a pending vote on banning commercial marijuana in the Matanuska-Susitna Borough and Budding Alaska LLC was tabled due to questions from the board that went unanswered, since nobody was on the phone to answer them. The board's meeting this month is the culmination of months of work by regulators to craft state rules, and preparation by businesses to get their commercial operations in order. The businesses must receive approval, and in some cases complete applications at a local level, and must have a final inspection from the state Alcohol and Marijuana Control Office before they can open their doors. The meeting will continue Friday, with 20 more cultivation licenses on the agenda.